In our family, there are a lot of traditions that stem from all of our heritages. I am of Italian and German descent and my husband is English and maybe some other pieces and parts from the United Kingdom. So, when it comes time to celebrate the holidays, I often like to mix all of our family backgrounds into the traditions. 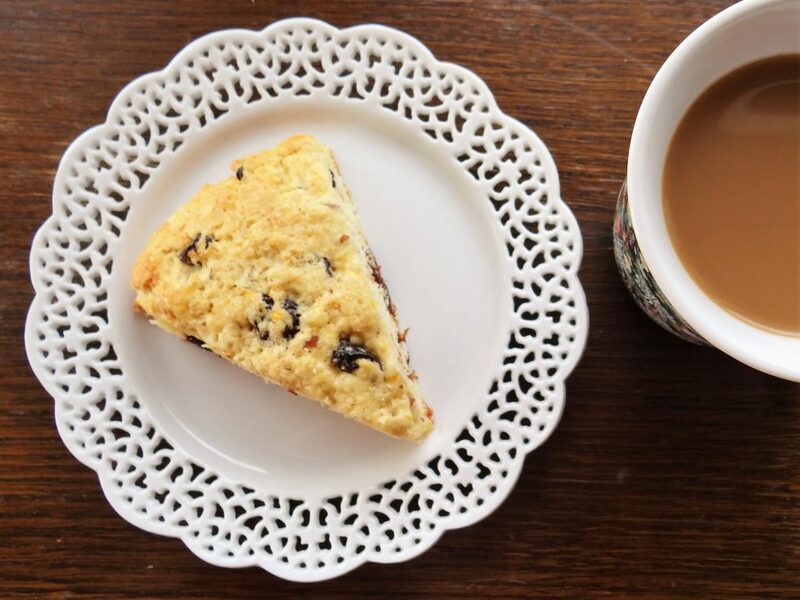 One of my husband’s favorite breakfast pastries is a Classic English Scone. He loves having a light breakfast treat with his morning tea. It also ends up being a quick and delicious pastry for our holiday mornings. But, as I always do, I love to take a basic recipe and add a few twists to give it a completely different flavor. It is just my way of taking a tried and true recipe, tweaking it with different ingredients, and making it a NEW tried and true. That is how Cherry Almond Scones came to be. I started with my recipe for Classic Cream Scones. Next I substituted some ingredients like dried cherries, almonds, orange zest and some different extracts. That’s all. Now you can try different ingredients, like dried fruits, nuts, citrus zest and flavorful extracts to come up with your own new scone recipe. 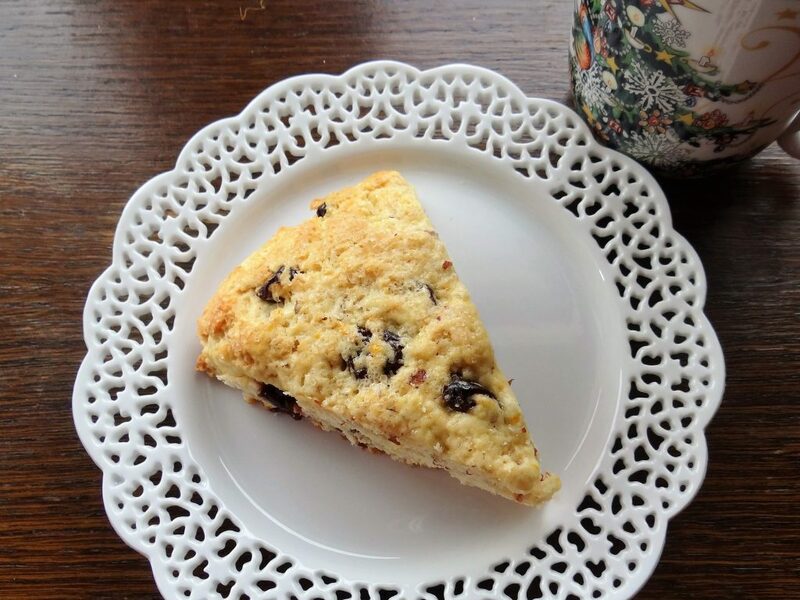 This recipe for Cherry Almond Scones can be made in less than 30 minutes. How’s that for a quick holiday breakfast idea? And they go well with a nice yogurt and fruit parfait, and of course, a proper cup of English tea. So, Happy holidays from the “English” corner of the Memorable Kitchen! Preheat the oven to 425 degrees. Line a baking sheet or pizza pan with parchment paper. In a large bowl, stir together flour, sugar, baking powder, salt and orange zest. Cut butter into small pieces and distribute over the flour mixture. With a pastry blender or 2 knives used scissors fashion, cut in the butter until mixture resembles coarse crumbs. You can also mix half the flour mixture with the butter in a small food processor and then blend with remaining flour. In a small bowl or empty food processor, mix together 1 egg, heavy cream and extracts. Mix into dry mixture and stir until combined. Stir in the dried cherries and almonds. Pat dough into a 12 inch circle on the parchment lined pan. Mix together egg and 1 teaspoon water. Brush lightly on surface of dough. Discard extra. Score the dough, like you are cutting a pizza, into 8 even wedges. Do not separate the wedges. Cool for 5 minutes on a cooling rack. Serve warm with butter and jam. Note: You can substitute fat free half and half for the heavy cream.